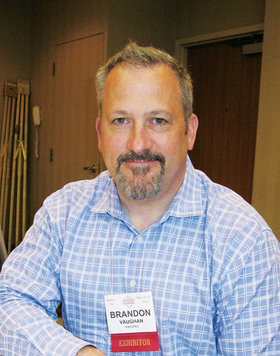 Brandon Vaughan, sales manager, ViscoTec-America Inc. Sales Manager Brandon Vaughan believes the manufacturer of high precision dispensing systems has secured just a small fraction of the business available. ViscoTec sells these specialized machines, which are built at ViscoTec Pumpen- u. Dosiertechnik GmbH, the company's headquarters, located near Munich, Germany, to a variety of industries, including automotive, electronics, pharmaceutical, aerospace, food and consumer goods—”just about any manufactured product,” Vaughan said. Customers include many original equipment manufacturers—including Honda Motor Co. Ltd., Toyota Motor Corp., General Motors Co., Magna International Inc., Denso Corp.—as well as several electronic manufacturers. He said his company's machines apply material to most of today's smartphones. “There are so many applications and offshoots that we don't even know about yet,” Vaughan said. The company employs about a dozen in two North American facilities, one in Detroit and another in Atlanta. The firm's ambitious five-year plan, he said, is to double its staff, expand its customer base and implement a service and sales office in Detroit that covers the West Coast. According to Vaughan, ViscoTec's machines are different than others, as they use a servomotor drive. They can be programmed to dispense as much or as little material as an application needs. He said ViscoTec's pumps are able to dispense one-component and two-component products, as well as shear-sensitive material, without wearing out the material or damaging the pump. He said servomotor machines prevent waste, reduce labor costs and downtime, and extend the life of the machine. The cost of the machines can range anywhere from $3,000 to more than $70,000. “We have systems that will pump tiny, tiny quantities. Sometimes it's a single pump; all it needs to do is dispense a tiny bead. So that would be a pretty inexpensive system,” Vaughan said.